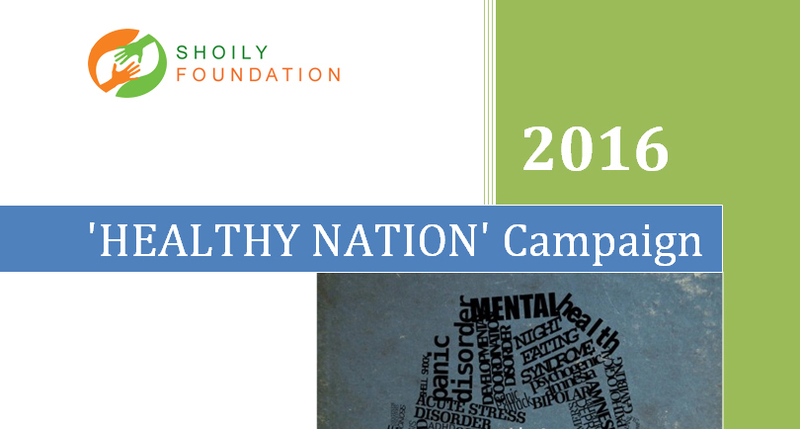 “HEALTHY NATION” is a nationwide campaign by ‘shoily foundation’ promoting HEALTH issues. With the oath “Shustho thaki, Sushtho rakhi” this health promotion and disease prevention campaign is designed to serve as a roadmap for improving the health of people in the Bangladesh by the end of the 2016. “HEALTHY NATION”, an ambitious dream, is committed to a single, overarching purpose: promoting art of living. Good health is a key indicator of national development, leadership, and productive economy. Our concept of this campaign developed around a national development mechanism. Our campaign expects to stimulate and enable – Quality of Life (health, recreation, rights, values, beliefs, aspirations), Improved Income and Education, Skilled Work force, Motivated future generation, Cultural and social value, Community service and responsibility, Gender balance and finally Increased National Equity. Currently contacting with Square Pharmaceuticals/Incepta Pharmaceuticals as for sponsor and endorsing by Ministry of Health and Family Welfare, the campaign covers the following 4 core areas of good health: General health (medicine, nutrition, self-nurturing etc. ), First Aid, Physiological well-bring, Mental well-being & Counseling. With trainings, workshops, resources, and membership programs will be going to reach out to major cities targeting 50 thousand participants by year 2016. Developed with the knowledge from a yearly research and survey on all trained and more than untrained 100 people “HEALTHY NATION” will also be compiling national data to show indicators of healthcare development and awareness on health issues and gaps. A three body team will contact with school committee about fixing the campaign date and hang the banner, posters etc on the campaign day. Two volunteers will commit registration task. Completed registration process will be delivered with a unique ID which will keep a record for central database. Posters describing health issues (Oral, dental, sexual, adolescence, mental preventive measures). Students would be vowed on trying their best to be healthy citizen upon finishing the presentation. Health awareness promoting presentation: 1 hr (60 slides) by a good presenter (senior MBBS student or health representative). This divided into 4 parts, such as 1) Eye camp (Preventive blindness), 2) Dental and Oral checkup and care, 3) Mental health camp includes Physiological well-bring, Mental well-being & Counseling and 4) Free checkup and physiotherapy consultation includes self-nurturing, first aid counselling. This setup will be performed on 4 different desks just after the presentation (Prime task) in the school corridor. Weight machine with BMI ideal chart, Height measurement would be provided for self-test beside the camping desks. Compiling national data to show indicators of healthcare development and awareness on health issues and gaps. It would be done by 3 volunteers. This data will be provided to Ministry of Health and Family Welfare for their record. Say good bye all and providing them a health HOT-LINE number to have a contact with us (Verifying with a membership ID number) about some preventive health issues. This one can be supported by “Kaan Pete Roi” team. It may end over with a group photo session. Recognized by: Ministry of Health and Family Welfare (Under communication). Sponsors: Square Pharmaceuticals OR Incepta Pharmaceuticals (Under communication). Initiated and Organized by: Shoily Foundation. Strategic partners: Bangladesh Eye Donation Society, Kaan Pete Roi (For hot line help). We will be acknowledged to hearing from you about any campaign issue, any critic or any other valuable remarks.